Mairead Corrigan Maguire discusses conflict with Vatican officials. 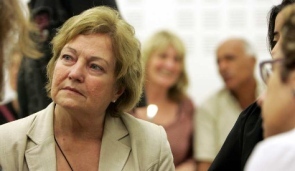 Irish Nobel Peace laureate, Mairead Corrigan Maguire, has said she is hopeful that a strong message of peace will come from the Holy See in support of troubled Syria. Discussing the Syrian crisis, she underlined that non-violence, dialogue, reconciliation and peace are the keys to solving the conflict. She made her comments to the Fides News agency after her meeting in the Vatican this week with the Secretary for Relations with States, Archbishop Dominique Mamberti, and the President of the Pontifical Council for Justice and Peace, Cardinal Peter Turkson. Maguire was awarded the Nobel Prize for Peace in 1976 for her commitment to solving the conflict by peaceful means in Northern Ireland. “A very clear message of non-violence and reconciliation are urgently needed as roads to peace. They are the paths that Jesus chose,” explained Maguire, who is coordinator of the Belfast-based NGO ‘Peace People’. Speaking to Fides about the Syrian situation, she described it as “very complicated due to new outbreaks, violence and weapons.” Maguire warned that the figures for victims were “frightening” and comparable only to the Rwandan genocide. After two years of conflict, she suggested that it was necessary to bring about an end to the violence and to support those who seek to bring people together, to propose a dialogue, starting with a cease-fire and an end to indiscriminate violence. “A political solution should be strongly reconsidered,” she urged. Maguire made a trip to Syria last May as head of a peace delegation, where they visited refugees in the troubled country as well as in camps in Lebanon. For Maguire, the peace accords in Northern Ireland may be a model for bringing about an end to the conflict in Syria. She concluded by calling on the international community to support those who promote inclusive dialogue in the country wracked by civil war since March 2011. The UN estimates that as many as 90,000 to 100,000 people have died in the conflict as of the end of June 2013.